Hi there. I am a life long rider and cycling enthusiast. I enjoy all kinds of bikes, but especially have come to love hand built steel classics built from the 30’s through the 80’s. I have focused on restoring French touring and randonneuring bikes and other classic lightweights. I welcome your comments and suggestions. If you are interested in purchasing a bike featured in a blog post, please visit my Store page and my eBay site. If you like the photos you see in this blog, you can purchase them as greeting cards, framed pictures, and other media at my Redbubble site. I also have a FB page where you can post your restoration projects and bicycle photos, and you can visit me on Twitter @restoringbikes. Nola, I was dazzled by the Camille Daudon. Can you pls let me know the frame size (assuming it is not finished and sold already? Thanks. Hi Miranda, the Daudon is indeed a dazzling beauty. I am holding off restoration while I contemplate the best way to treat this rare bike, which was custom made for Irene Faberge Gunst in 1947. I’ll be sharing a blog post soon. Thank you for the response, I’m looking forward to reading how you tackle the project. I’ve done some homework and I gather that getting components for older French bicycles can be challenging in terms of threads and tube sizing. I’ve also realised how rare and special this bicycle is, not quite the elegant steed for low maintenance, trouble free zooming around town that I had imagined! Best of luck. Wonderful site and great restorations. I just had a question about a bicycle on your site. I noticed that the seat clamp on the bicycle on the header page is reversed of what I knew to the the only way to install a seat clamp. Can a seat clamp always be installed in this position. I’m glad you like the site. Yes, a seat clamp can be installed in either direction, but the standard way is to have the closed part of the clamp at the front of the saddle. In the photo you mention, the clamp is installed in the reverse direction. This is useful when riding a bike with slack angles or perhaps a too long top tube – it brings the saddle closer to the front of the bike. 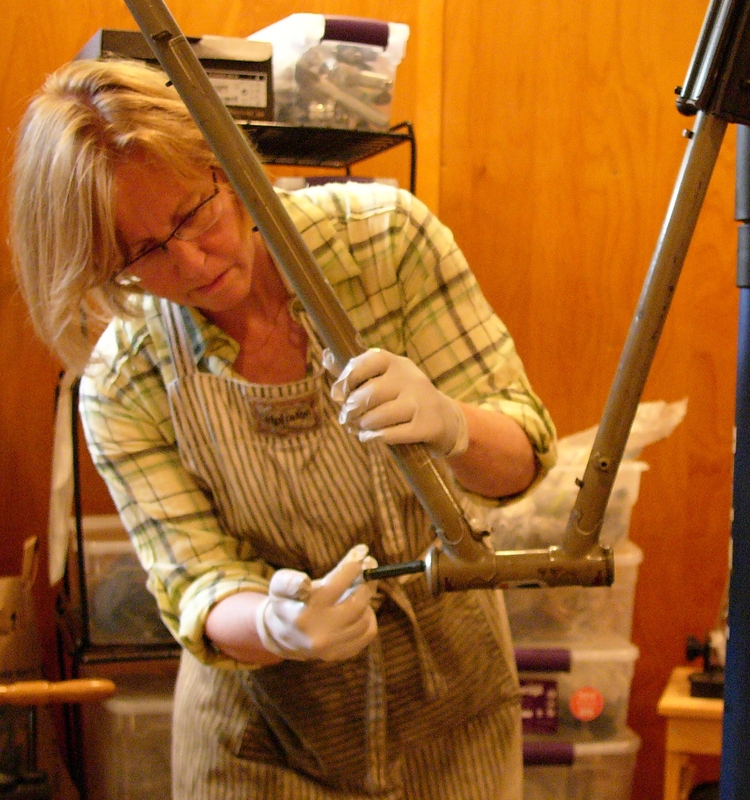 How did you get started in bike restoration? Did you take any formal classes in bike repair/overhaul or learn “on the job”? (I do see that you took a frame-building class at UBI). How do you find your bikes? Any good stories about “barn finds”, etc.? I see you’re a CPA so I assume that’s how you make your living, and not by wrenching. I find working on bikes relaxing, and I’d like to expand into restoration like you do. You’re fortunate to live in such a bike-friendly area – I’m in Florida and most people here are too busy trying to run over cyclists rather than appreciate the bike culture! Keep up the great work, and show us some of your best “barn finds”! Thank you. I have always worked on my own bikes, but took a professional mechanics class from UBI a number of years back. I definitely recommend some kind of formal training because of the safety issues involved for both your customers and yourself. As far as making a living goes, this kind of work is not really scalable so it does help to have other streams of income especially while starting out. I have chosen not to have a brick and mortal retail presence at this time. Since there are riders and collectors all over the world, and since technology can now put us in contact, this has worked well for me. I think the tide is turning regarding the importance of cycling in daily life. A bicycle has so many appealing aspects – it provides transportation, sport, health, peace of mind, and has little negative environmental impact. And, vintage bicycles were not only works of art, but were built to achieve mechanical perfection – an ethic which I think is finally returning to the industry at least among custom builders. Hi Nola, Thanks for your blog – its great! I’m currently undergoing my first restoration project on an 80s Windsor Woodstock road bike. There is alot of rust on the rims, handlebars and chain cog – do you have any tips on how to remove this or do I have to get new parts? Also, what is the most effective way of re-painitng the frame in order to get a ‘smooth’ look? Any tips appreciated. I’m glad you like the blog. I am not familiar with Windsor bicycles. It sounds like you have steel and/or chrome wheels and handlebars. If the chrome is really bad, and not just a bit pitted, then when you try to clean it, the chrome will just come off. In that case you would want to replace the bars and possibly the wheels. If the bike is not a rare bike you might be happier upgrading the wheelset to an alloy set which will be lighter weight and will not rust. Upgrading the wheelset may also give you more options for gearing choices. As far as painting goes, I generally do not believe in repainting frames for the rarer bikes, but if you are doing an upgrade, then re-painting is fine. I definitely recommend using an experienced frame painter. Good luck with your project! Hi Arun. If the rust is not too bad (little spots) then either cif cleaner with an old sponge works well, or I prefer aluminium foil with a bit if water. It creates a black paste (aluminium oxide) whoch removes rust without scratching the chrome. Use rubber gloves otherwise it’s hard to get off your skin. For worse rust you might consider fine steel wool and some wd40 lubricant to reduce the worst of it, then proceed with the alu foil. Course steel wool will scratch the chrome. Great suggestions, Alex! Also I have added a Queries page to my site to help answer these kinds of questions. Thanks to you both Nola and Alex! Most helpful. I’m going with steel wool and wd4o but its tough to get a nice finish. Would either of you recommend a light coat of chrome/metal paint for the wheels/bars? Hi – you could re-chrome the bars but I would hesitate to do that on the rims. Remember – a little bit of rust on the rims helps to improve braking! Seriously, though, it really is okay to have some rust left but you want to stop the rusting process from continuing. Congrats. for being highlighted by wordpress.com!